One of the most popular haunts for strawberry lovers in Cameron, this farm is known to produce quality strawberries for sale. 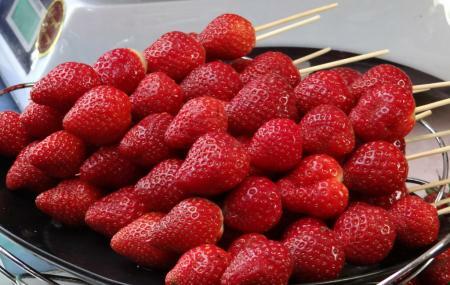 Herein, you get a chance to pick your strawberries and learn about how they are cultivated. You will also be guided as to which strawberries to pick depending upon their size and colour. Apart from strawberries, this farm also houses a display of cactus, various flowers and organic vegetables for your consumption. How popular is Healthy Strawberry Farm? People normally club together Steamboat Snack Corner and Highlands Apiary Farm while planning their visit to Healthy Strawberry Farm. My favourite place to buy the healthiest Hibiscus plants. Children love to pick strawberries here and there's place to sit and eat your strawberries. A good collection of nursery plants and herbs makes this place extra. Car park is a bit small on busy days. We generally, as a rule, try to do such excursions on off peak days. There are so many strawberry farms in Cameron which you can visit, i visit this one which has so many plants planted, also you can buy them, they have so many varieties of cactus, and other plants too which i dont remember the names but all were beautiful. You can pluck fresh strawberries from the farm for yourself which i find really cool. Also you must try different eatables products made up of only strawberry and whatever i tasted was really good. I like the best is the frozen strawberry pipe Ice-cream. Abit pricey. A box of self pick strawberry is a our rm30. But the strawberry farm have alot of choice. And the quality is good. I met a good staff that help identify the good one for us.. I have nice experience there. Wonderful place to pluck your own fresh strawberries. They have got variety of plants. In all sizes small and big. Lots of flowering plants, cactus plants.